Last weekend I visited a higher end/designer consignment shop. 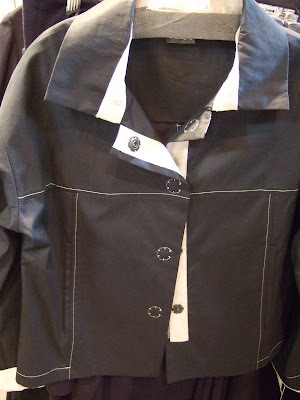 I saw a jacket with a really cool detail - I snapped a few pictures so I could share! The jacket is from Annette Görtz. It closes with several large sew-on snaps (I always think of Tany now whenever I see sew-on snaps, although in this case the snaps are not covered). The reverse side of the fabric is where it gets interesting. 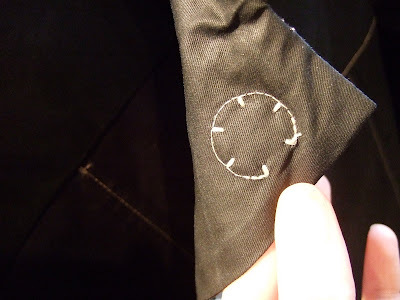 It looks like an incomplete circle in contrasting thread was stitched by machine where the snap is placed. Also, the contrasting thread that was used to apply the sew-on snap shows up as little 'bars'. I can only imagine how carefully one must work to achieve such perfect-looking stitches! What a cool detail! Thanks for sharing it. I think that one could negotiate this without too much difficulty if the circle part is done by hand as well. It could be done with a backstitch, first on the top layer only, then the bottom layer only, perhaps catching only enough of the underneath layer in each case to hold them together. Interesting. That IS pretty cool! They look a lot like the snaps on the jacket in this month's issue of Sew Stylish - you can't see them in the cover photo, but they're on the pictorial inside. I've been kind of wondering where to find them, because they're much nicer looking than the traditional sew-on snaps I've seen. Even if I found them, I'm not sure if I'd be able to get the stitching done so nicely, though! The whole idea looks great thought! I'd just have to hand-sew it. There's no way around it. It is a nice detail, though! And I'd love to get my fabric stash down, too. Espcially because I realized I have a lot of fabric, and if I can ever afford to move out of my parents' house, I'd have to put it all somewhere. So I think I'd rather use it! That's an interesting detail. It looks to me like you could stitch the circle by machine first (precisely marked and stitched ever so slowly and carefully!) 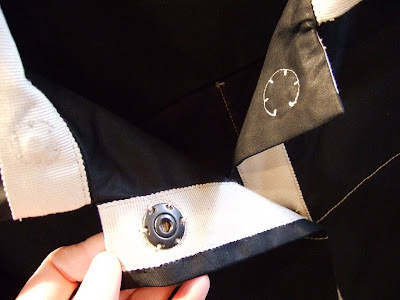 then center the snap in the circle and sew it on either by hand or machine. I saw that article in Threads about sewing snaps on with buttonhole stitch and I've been dying to try it. Oh, yeah. And I wonder why they didn't complete the circle? Oh I would definitely sew the snap on by hand. The decorative circle I would do first though and that could go either way - by machine or by hand. Paula - I don't know why they didn't complete the circle! It looks cool how they are all oriented the same way though. That's really nice. Totally worth it to do it by hand. That's a very neat detail. So many ideas for us to use! Good snoop shopping!! What a jazzy way of putting snaps on!! I wonder if the non-sewer could look at that detail with the same awe. That is a very cool touch - and also done by one of those specialty sewing machines you'll find in industrial workrooms. you can tell that the snap was positioned, and the machine is calibrated to stitch around the outside, and at every opening it does the equivalent of a bar tack. 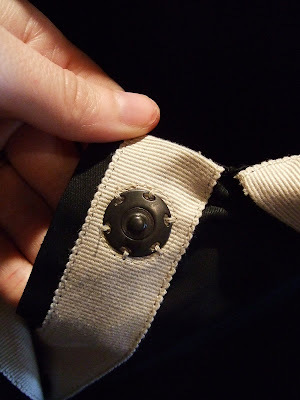 See how the stitch for each bar tack goes right back into the same stitch hole as the stitching around the snap? And they start at one hole, stitch around to the last hole, and get each hole stitched with a bar tack, then stop - which is why they didn't close the circle. Have you ever seen the YouTube video of the jeans factory? They have all sorts of fabulous one-function machines. I love little details like these! Thank you so much for sharing! Where can I buy these snaps? I have a sweater that would look great with this type closure, I need snaps that are not metal and about an inch in diameter.